When you stay at Station Hotel in Dudley, you'll be in the historical district, within a 15-minute walk of Black Country Museum and Dudley Zoo and Castle. This hotel is 8.2 mi (13.1 km) from Broad Street and 8.4 mi (13.6 km) from Arena Birmingham. With a stay at Quality Hotel Dudley, you'll be centrally located in Dudley, within a 5-minute drive of Black Country Museum and Dudley Town Hall. This hotel is 8.3 mi (13.4 km) from Broad Street and 8.6 mi (13.8 km) from Arena Birmingham. At the heart of the Black Country, this fine modern hotel overlooks the Waterfront Canal Marina and is just minutes from the prestigious Merry Hill shopping centre. Ideal central England hotel for business or pleasure and with plenty to do for the single traveller or families. FREE Wi-Fi available for all guests. Established before the invasion of William the Conqueror, Dudley has a proud industrial and political legacy, and still retains a strong independent town identity, despite being part of the West Midlands conurbation. The town is often considered the heart of the Black Country, which was one of Britain's industrial powerhouses and played a pioneering role in the European Industrial Revolution. The town became an important Norman defence in the late 11th century, but remained a relatively quiet, unknown community until the Georgian era, when the construction of the Dudley Canal provided revolutionary trading opportunities. By the early Victorian period, Dudley was one of Britain's chief industrial centres, with a highly successful mining industry that prevailed until the late 20th century. Built in 1070, this ruined landmark is now protected as a Grade I listed building and was an exclusive residence until the 18th century. Like many other medieval defences, Dudley Castle was targeted in the English Civil War, when the Royalists held the castle for two years, and was partially demolished after the Parliamentary victory. However, the building was reopened to the public in the 1990s and is now one of the Midlands' leading tourist attractions. Showcasing the Black Country's extraordinary heritage as the birthplace of the Industrial Revolution, the Black Country Living Museum opened to the public in 1975. It comprises a special open-air exhibition with numerous preserved former-industrial buildings over an area of more than 10 hectares. No trip to Dudley would be complete without visiting the town's famous zoo. Opened in 1937, this picturesque 200-acre park is overlooked by the castle and exhibits many rare species from all over the world. Visit the vibrant city centre of Birmingham and explore the trendy cafés of Brindleyplace before seeing majestic Victoria Square and the renowned Birmingham Museum and Art Gallery. Birmingham is also home to the enormous National Sea Life Centre, many bustling nightclubs along Broad Street, an outstanding 21st-century library, and a thriving German Christmas Market. Further south in Worcestershire, you can visit Hagley Hall, a fine Georgian mansion that is known for its distinctive Neopalladian features. Although still a beloved family home, the building is regularly used as a luxury private functions venue and is within easy reach of all Dudley hotels. 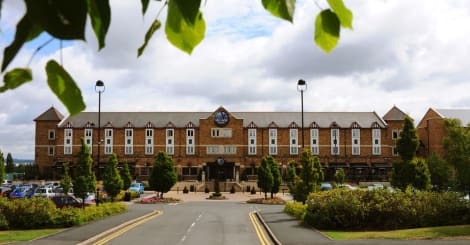 For affordable, elegant accommodation in a contemporary setting, choose the friendly Premier Inn Dudley Kingswinford or the Premier Inn Dudley Town Centre. Other great value-for-money options in the area include the stylish and hospiSEOSITE_LEVEL_DESCRIPTION Holiday Inn Express Birmingham Oldbury M5 Jct.2 and the Copthorne Hotel Merry Hill Dudley.